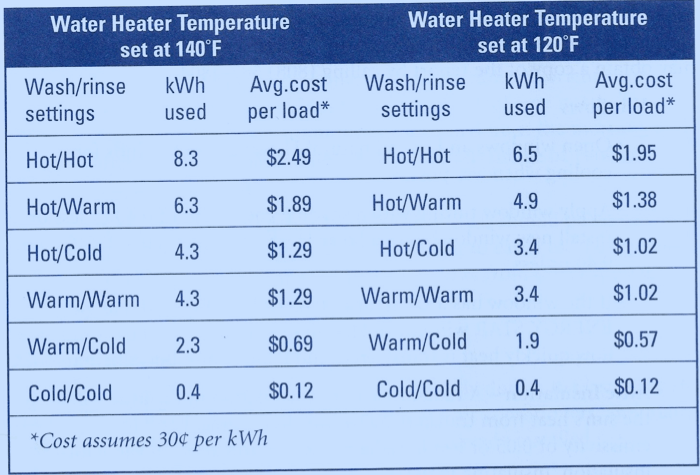 Washing in anything except cold water will cause your clothes to fade, will not improve cleanliness, and will cost you 16-20x as much on your electric bill. Your Mom might have said to wash in warm or hot, but that’s because detergents back then were not effective in cold. Today’s detergents are. The only reason you’d ever want to wash in warm or hot water is if there’s grease or oil on your clothes. Otherwise, you’re just wasting money and causing extra pollution. There literally is no difference in outcome as far as how clean your clothes get. However, there is one major difference: washing in hot or warm water will shorten the life of your clothes by increasing fading. So wash in cold unless you have oil or grease on your clothes, and ALWAYS rinse in cold. 2. Always wash full loads – Even though your washing machine may have different settings that will control the amount of water it uses, it will still use close to the same amount of energy regardless of how much your washing. So instead of washing a bunch of smaller loads (which will end up using more energy), try only running your washing machine when it’s full. 3. Turn off the extra rinse cycle and turn on the eco-boost (if your washer is equipped). If I told you that you could spend either $5 to wash your clothes or $2, and they would be just as clean regardless of which option you chose, you’d likely pick the $2, right? The same thinking should apply to the settings on your washer. Most modern washers work well enough that turning on settings like the “extra rinse” doesn’t actually get your clothes any cleaner, instead, it just costs you more money. Do yourself a favor and turn off the extra rinse, but while you’re at it, be sure that the eco-boost function is turned on. Many modern washers have this feature built in and by turning it on you’ll help to ensure that your washer is running efficiently. Your dryer works by pumping heated air into it a drum where your clothes are being constantly turned and rotated, thus forcing the moisture out of your clothes. Your dryer then passes the moisture being removed from your clothes out a vent. Pretty straight forward. However, that moisture will take with it little pieces of your clothing (aka lint) and that lint will eventually build up on the screen. When this happens the dryer has to work harder to push that heated air through its system, and thus uses more energy and costs you more money. 2. Use a lower heat setting. The heat being generated by most dryers “regular” setting is far more than is necessary to sufficiently dry your clothes. So the next time you’re drying a regular sized load of laundry, try using the “delicates” or “permanent press” setting. This will reduce the temperature of the air being used to dry your clothes, but should still be enough to get them dry. 3. Use the moisture sensor setting (if your dryer is equipped with one). This setting will tell your dryer to use its built in moisture sensor in order for it to determine when it needs to turn off. The moisture sensor (which is located inside the drum of your dryer) will actively sense whether or not moisture is still present in the air inside your dryer. If there is, the dryer will keep running, if not the dryer will turn off (presuming you keep your dryer’s moisture sensor clean). Often times your dryer doesn’t need a full hour to dry a load of laundry, so by using the moisture sensor setting your clothes will still be dry but your dryer won’t run longer than it has to. 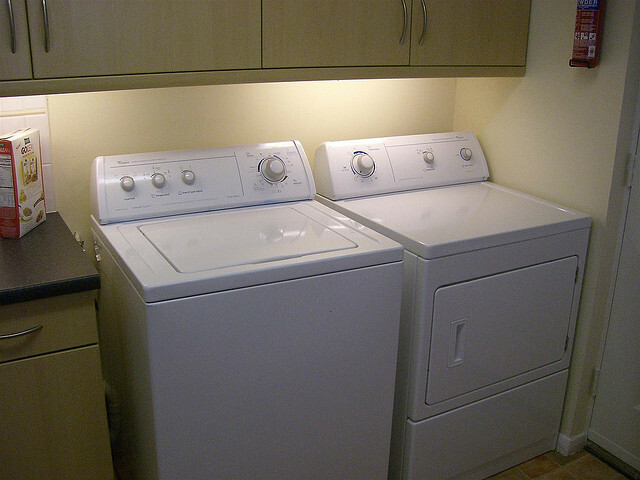 However, if your dryer doesn’t have a moisture sensor you can still accomplish the same thing by…. 4. Dry your clothes for less time. If you have an older dryer that doesn’t have a built in moisture sensor, try drying your clothes for less time (we recommend 40 minutes to start). If after 40 minutes your clothes aren’t dry simply continue drying them in 10 minute increments until they are. After all, you can always add dry time, you can’t take it away. Here’s a magnet that Pono Home gives to customers to put right at the point of use, that reminds people about all these tips! If you’re looking for more ways to save water, energy and money around your home, be sure to check out our green home improvement projects: Green Living Ideas, after all, is a top 20 home improvement website!